3rd Annual Summer Online Issue is HERE! The 3rd annual So to Speak Summer Online issue is here! 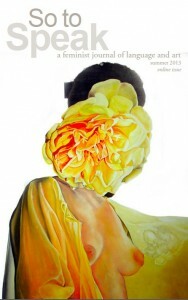 Our editorial staff is proud to showcase the work of these feminist writers and artists in the Summer 2013 Issue. This issue includes all of the genres you’ve come to expect from So to Speak: extraordinary fiction, nonfiction, poetry, and visual art! Read the new issue HERE or click on the cover art to the left. Later this summer, be sure to check our blog for posts by our contributing writers and artists, as well as guest writers, on craft and their views on feminism. Our blog offers a continuous dialogue on feminism, which can be found in surprising places! Be sure to engage with the contributors by commenting on their blog posts and offering further ideas in the comment box. Hey, This summer issue looks amazing! Thank you all so much for choosing my poem to be a part of it. Do you all print hardcopies of the online summer issue? Thank you for contributing to our summer issue! Unfortunately, we do not print hardcopies of the summer issue. Feel free to submit to our fall and spring publications, which are print versions of the journal.